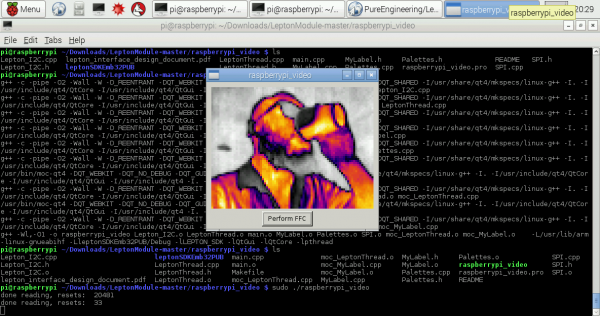 Note: This tutorial was originally written for the FLiR Lepton [KIT-13233]. 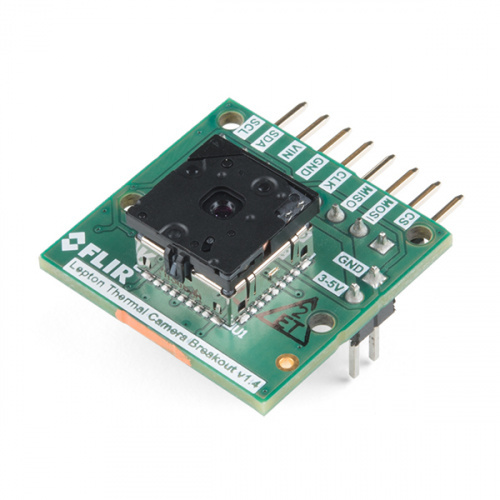 However, the FLiR Lepton 2.5 with Radiometry should function the same. When our team found out that we’d be testing a Long Wave Infrared (LWIR) camera, there were two words that we couldn’t stop saying: Predator Vision. That’s right, we were finally going to be able to see the invisible world of heat, which would aid us greatly if we ever found ourselves hunting a team of special operatives in a remote jungle… or, you know, trying not to scald ourselves on a hot cup of tea. As it happens, the FLIR Lepton is an excellent little module for the price and Pure Engineering has done a bang up job spinning the breakout board and documentation. Having a hard time seeing the videos? Try viewing the videos in full screen mode. To follow along with this tutorial, you will need the following hardware and software. You may not need everything though depending on what you have and your setup. Add the hardware to your cart, read through the guide, and adjust the cart as necessary. 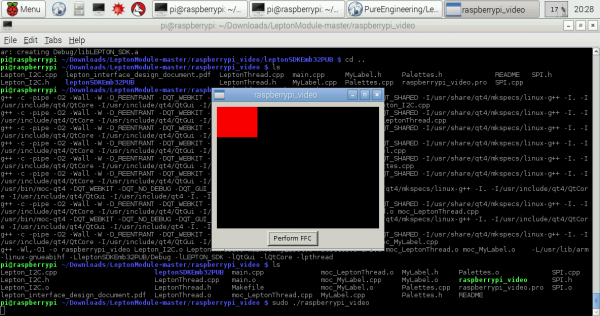 Today we’ll be setting up the Raspberry Pi example code as provided by Pure Engineering and featured in our product videos. 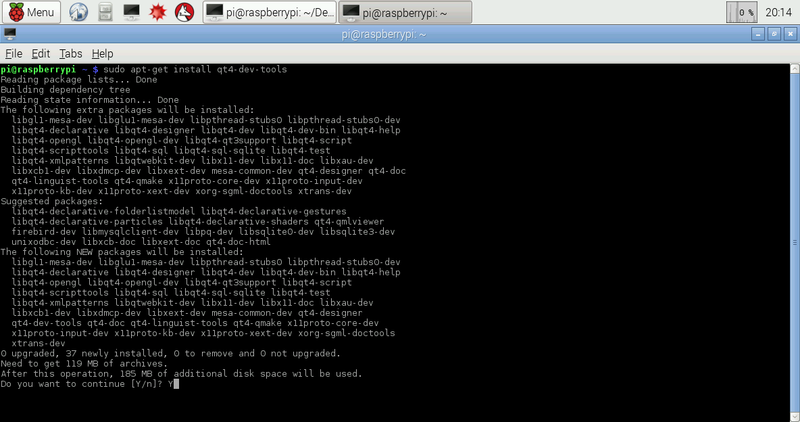 At a minimum, we’ll be needing a Raspberry Pi... and not much else, actually. Just a handful of jumper wires as well as a monitor, keyboard, accompanying cables for your Raspberry Pi, and the FLIR Lepton camera of your choice. Note: To reduce the number of components used, you could wire the thermal camera straight to the Pi using F/F jumper wires. For a secure connection, you could also use solder a custom Raspberry Pi hat using a prototyping board. Heads up! If you are getting the PureThermal 2: FLIR Lepton Smart I/O Board, the board does not include the FLIR Lepton camera module. However, this handles control of the camera and raw video data via USB. This is useful if you are attaching it to your computer and using it as a USB web camera. For more information on setting up the smart I/O board with your computer, check out the following videos related to your setup to install the official Lepton app. 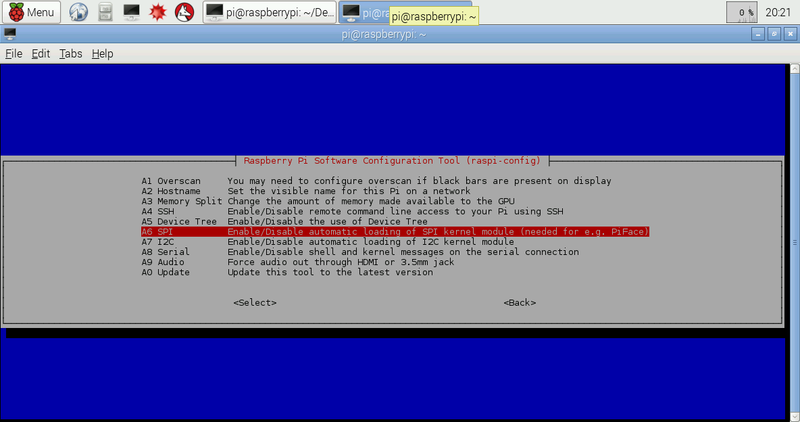 The example code has been tested on a Raspberry Pi model B, but it should work fine on any model so long as you have Raspbian installed. You will also need to install the QT dev tools and example. Check out the Software later in the tutorial for more information. If you aren’t familiar with the following concepts, we recommend checking out these tutorials before continuing. 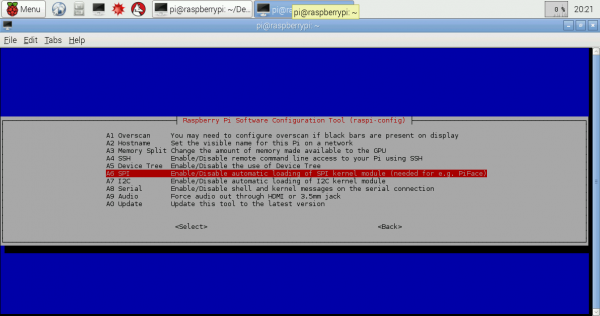 This tutorial will assume you have a little bit of Raspberry Pi knowledge. If the Pi is new to you, have no fear. 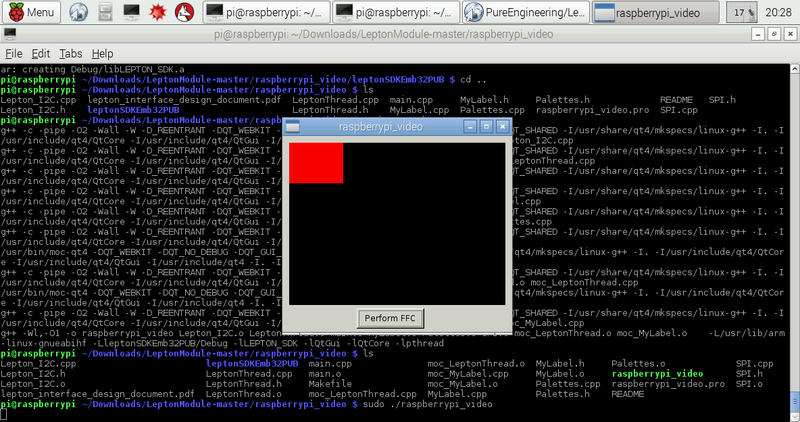 You can visit our Installing Raspbian and DOOM tutorial, if you need a primer. 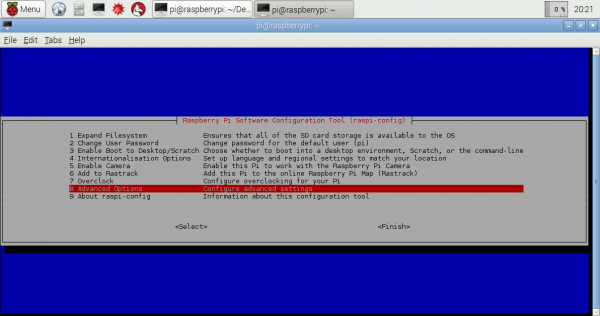 Also helpful is our Raspberry Pi GPIO tutorial. The Lepton uses SPI communication to send its video stream and it uses an I2C-like Communication protocol as the control interface. If you are unfamiliar with either of those communication methods, please visit the corresponding tutorials. Electromagnetic radiation is all around (and within, and throughout) us and is comprised of everything from gamma radiation on the high frequency end to radio waves on the low frequency end. While most imaging sensors detect radiation in the visible spectrum (wavelengths from 380 to 700 nanometers), long wave infrared sensors detect radiation from 900 to 14,000 nanometers. This is known as the infrared spectrum, and it accounts for most of the thermal radiation emitted by objects near room temperature. 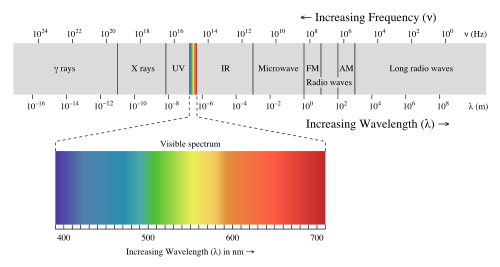 Electromagnetic spectrum with visible light highlighted. Image courtesy of Wikimedia Commons. 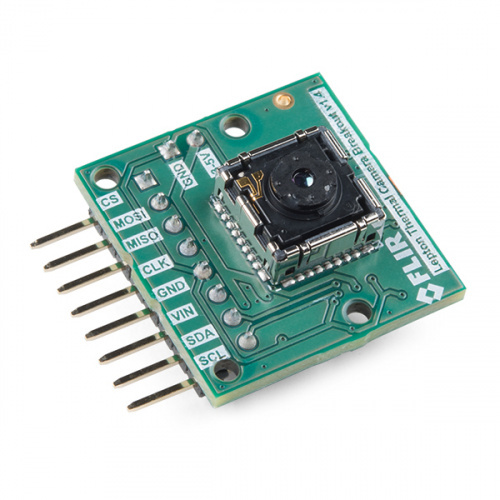 The sensor inside the FLiR Lepton is a microbolometer array. Microbolometers are made up of materials which change resistance as they’re heated up by infrared radiation. By measuring this resistance, you can determine the temperature of the object that emitted the radiation and create a false-color image that encodes that data. Thermal imaging of this type is often used in building inspection (to detect insulation leaks), automotive inspection (to monitor cooling performance), and medical diagnosis. Also, because of its ability to produce an image without visible light, thermal imaging is ideal for night vision cameras. When it comes to robotics, thermal cameras are especially useful heat detectors because the image that they produce (by virtue of being, well, an image) can be processed using the same techniques and software as visible light images. 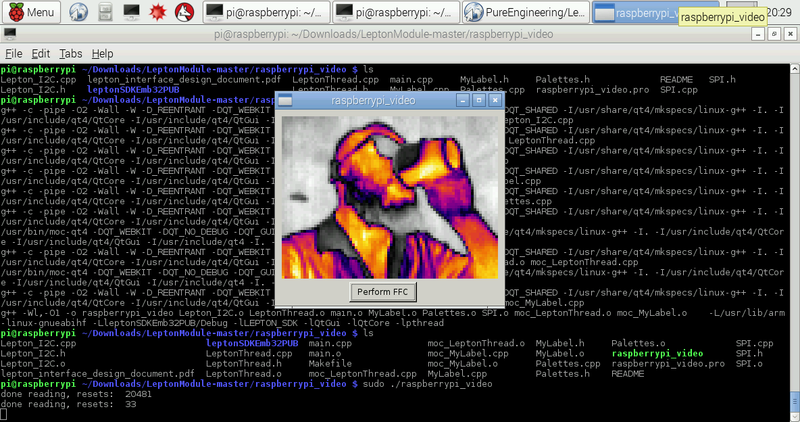 Imagine using something like OpenCV to track, not just color centroids, but heat centroids! That’s right, you could be building heat-seeking robots right in your own home! Listed below are some of the characteristics of the FLIR Lepton's specs. The cells highlighted in blue indicate the slight differences between the two versions of the FLIR Lepton camera module. ⚡ Warning: It is worth mentioning that while the Lepton module isn’t particularly sensitive to electrostatic discharge, it is a complex and relatively pricey component. You might want to take a few precautions while working with it so you don’t accidentally zap it. Connect the FLIR breakout to the Raspberry Pi GPIO according to the diagram below. 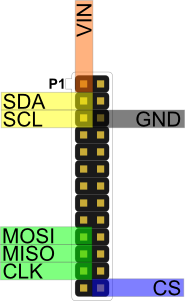 If you need a refresher on how the GPIO pins are oriented, visit our Raspberry Pi GPIO tutorial. Make sure that your Lepton module is securely snapped into the socket on the breakout board. Heads up! If you have issues getting the camera to work (i.e. you see a red square and no image) with pin 26, you may need to adjust the CS pin to pin 24 (next to the CLK pin) like this tutorial from FLiR. There are several methods of connecting and mounting your system together. If you used a breadboard and LCD touchscreen with the Pi, your setup should look similar to the image below. Congratulations, that’s the hardware part done. 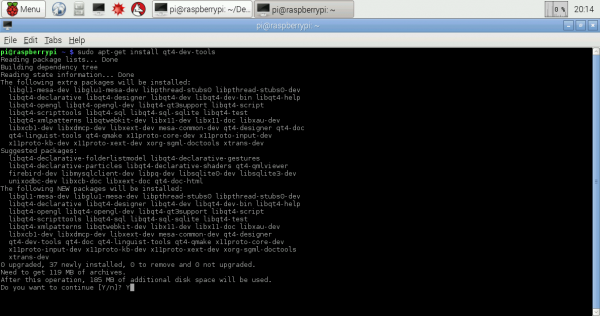 Now onto the software configuration! You should be presented with the following screen as shown below. Click on the "Advanced Options" menu. Select SPI and follow the instructions on the following screens. After you've completed the SPI steps, do the same thing for I2C. When you exit raspi-config, it will ask if you want to reboot. Go ahead and do it so that the changes we just made will stick. Once installation is complete, go to the Pure Engineering GitHub repo to download the examples. 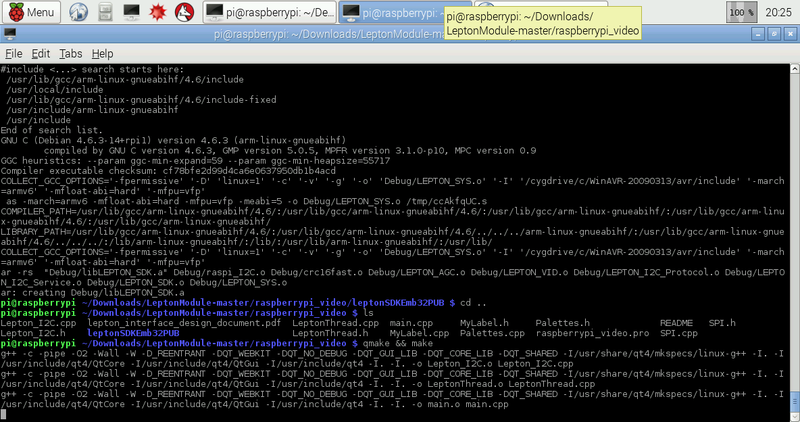 Now cd into the unzipped folder "LeptonModule-master". First, we need to "make" the Lepton SDK. 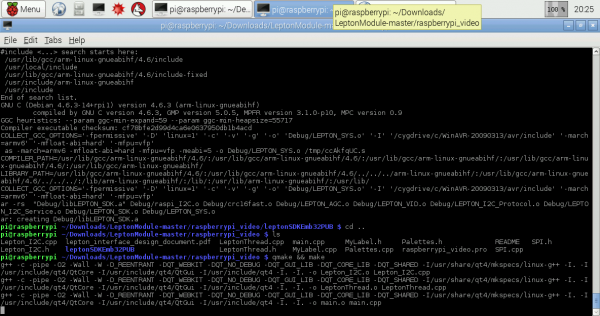 Use the cd command to navigate to the ".../software/raspberrypi_libs/leptonSDKEmb32PUB" directory and run the make command. Troubleshooting Tip: You may get an error like the one shown below: a red square in a blank window. If this is the case, carefully remove the Lepton module from the breakout board. That's right, pull it from the socket, while it's powered. Then (again, very carefully) pop it back into place. Images should start pouring in! Remember, if you have issues getting the camera to work with pin 26 on the Pi, you may need to adjust the CS pin to pin 24 (next to the CLK pin) like this tutorial from FLiR. Aim the camera at something hot or step in front of it to begin viewing heat signatures! Now that you're successfully retrieving LWIR images from the Lepton module, you can dig into the example code and apply it to your own project! Lepton Module GitHub Repo -- Library, Example Code, & Design Files. The example in this tutorial uses the code from this repository. Thermography has hundreds of applications. Spend some time just playing with the camera to see where you might find uses for it. Try piping the frames captured from your Lepton module into some computer vision software like SimpleCV! We'd love to see what you do with the FLiR Dev Kit so be sure to leave a comment and tell us all about it!